The city of Karachi is caught in a wave of violence that by some estimates has killed more people in the past three years than terrorist attacks in all the rest of Pakistan during that same period. It is the worst violence the city has seen since 1995, driven by a complex web of ethnic, political, and social tensions. The rights group says 490 people were killed in Karachi just in the first half of the year, compared to 748 violent deaths in all of 2010. 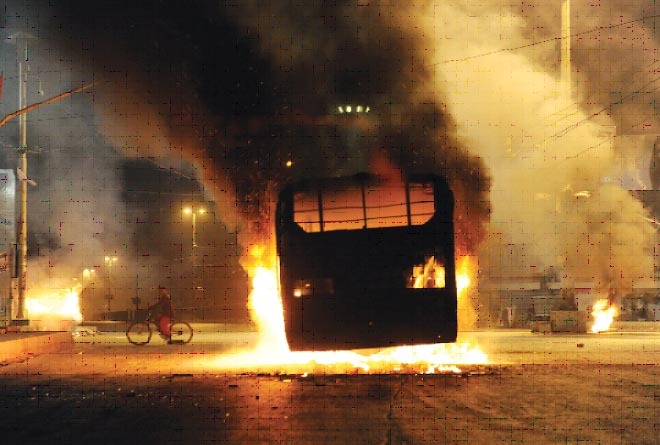 Despite the high number of deaths, Karachi-based journalist Ali Chishti says the ongoing violence in his home city has received little outside scrutiny. Much of the violence stems from a series of running clashes between rival gangs of the long-dominant political power in the city and a group of relatively new arrivals challenging their dominance. POWER SHIFT: For years power in Karachi has been held by the Urdu-speaking descendants of the immigrants who came from India at the time of partition in 1947. The ethnic group has wielded political power in the city through its party, the Muttahida Quami Movement (MQM). But analysts say the city has undergone a sharp demographic shift as ethnic Pashtuns, many of them displaced from fighting in Pakistan’s northwest tribal areas, have migrated to the city. Marvin Weinbaum of the Middle East Institute says young Pashtuns have often left the tribal areas to seek their fortune in Karachi, which is Pakistan’s economic hub. He says this migration has made the Urdu-speaking people very uneasy. INTERNAL SPLITS: Bouts of sectarian-based violence between Sunni and Shia Muslim groups have also been reported. Weinbaum adds that a further complication is a violent internal feud between factions of the MQM that has spilled into the streets of Karachi. “Part of this new element is that the Urdu-speaking population itself has split, so the MQM has now split. And it’s hard to tell sometimes, but that seems to be part of the mix right now which has been so lethal. So obviously it’s a very complicated situation, and it’s one that local authorities have never been able to get a real handle on,” says Weinbaum. The government has sent in paramilitary security forces, the Rangers, but has so far resisted sending in regular army troops. The army was accused by some groups of using an unnecessarily heavy hand to suppress unrest in Karachi in 1995. Journalist Ali Chishti does not believe the government can get a grip on the violence. Analyst Lisa Curtis of the Heritage Foundation says there is concern in American policy circles about the stability of the government of President Asif Ali Zardari. MILITANT PRESENCE: Curtis says the United States is concerned that Islamist terrorist groups may try to take advantage of an unstable situation. Ali Chishti says al Qaeda and Taliban figures have been hiding among Karachi’s Pashtun immigrant population. “They’ve actually planned and orchestrated attacks in Yemen, attacks in Bali. So it has a heavy al Qaeda and a Taliban presence. They have refuge places among people,” he says. “So if you map where most of al Qaeda, Taliban, and other people have been caught, it has to be in the outskirts of Karachi, where there’s a huge population of Pashtun refugees living in the city. So it has a large number of terrorist ghettoes,” Chrishti says. The so-called mastermind of the Sept 11, 2001 al Qaeda attacks in the US, Khalid Sheikh Mohammad, lived in a Karachi safe house in 2002. Captured later in Rawalpindi, he confessed to the kidnapping and murder of American journalist Daniel Pearl in Karachi that same year. And the Taliban’s military chief, Mullah Abdul Ghani Baradar, was detained by Pakistani forces in the southern port city in 2010.